In the whole text, only the first letter of titles should be capitalized, and any title should not be numbered. The order of the article should be followed the introduction, theoretical framework, literature review, methods, results, discussion, conclusion, and references. The article should be in A4 size, single-spaced, Cambria and 12 pts. Subtitles should be 12 pts and bold. Margins for the top, bottom, and sides should be 3 cm. Paragraph spacing must be 6 pts for both before and after paragraph. Paragraphs should not be indented. 1. 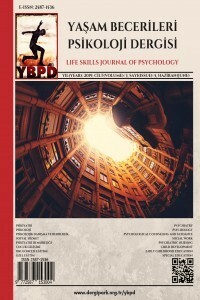 Turkish Title: The title of the article should be written in the most descriptive way, and it should be 14 pts and bold. It should not be written all capitalized. 2. Name and Surname of the author(s) should be placed after the Turkish Title. It should be 12 pts and bold. Also, at the bottom of the first page, authors' names, titles, company name, and e-mail address should be placed as a footnote. The size of the footnote should be 8 pts. When the name of the company is written, the whole name should be spelled out. Authors should avoid abbreviations. 3. Turkish Abstract: Title of the abstract should be 10 pts and bold. Also, the abstract itself should be 10 pts and justified text. Must be 225-250 words. This section should include the abstract of the research. The abstract should compromise where the research has been done, size of the sample, materials, statistical analyses, and results. The title of the Key Words should be 10 pts and bold, and the keywords themselves should be 10 pts. Keywords should have only first letter capitalized.All of the keywords should be italicized except the title. The list of keywords should include minimum 3 maximum 5 words. Also, when the keywords are listed, comma (,) should be used. 4. English Title: The title of the article should be written in the most descriptive way, and it should be 14 pts and bold. It should not be written all capitalized. 5. English Abstract: Title of the abstract should be 10 pts and bold. Also, the abstract itself should be 10 pts and justified text. Must be 225-250 words. This section should include the abstract of the research. The abstract should compromise where the research has been done, size of the sample, materials, statistical analyses, and results. The title of the Key Words should be 10 pts and bold, and the keywords themselves should be 10 pts. Keywords should have only first letter capitalized.All of the keywords should be italics except the title. The list of keywords should include minimum 3 maximum 5 words. Also, when the keywords are listed, comma (,) should be used. 6. Introduction: In this section, the researcher should mention the importance of the topic. The problem that will be discussed in the article should be explained clearly. 7. Theoretical Framework: Every variable should be explained separately in a theoretical framework. 8. Literature Review: the Previous literature of both domestic and international research should be included. 9. Methods: In this section, authors should mention the importance of the research, limitations, hypotheses, the scientific methods, statistical tools, and materials. Subtitles should not be numbered. Also, names of the materials should be 12 pts and italicized. 10. Results: This section should compromise the results and tables. The titles of the tables should be capitalized the first letter only, 12 pts, and bold. In the tables, again only the first letters should be capitalized and 8 pts. When using a table, the authors should follow APA 6th edition style. 11. Discussion and Conclusion: In this section, the authors should evaluate their research and compare with previous research. Also, implications and future suggestions should also be placed in this section. 12. In-text Citations and References: APA style must be used. The references should be intended for 0.6 cm after the line. Miklowitz, D. (2011). The bipolar disorder survival guide (Second Edition), The Guilford Pres. Fraenkel, J.R. and Norman, E.W. (2008). How to Design and Evaluate Research in Education. 7th Edition, McGraw-Hill, Boston, p.362. In J.A. Smith. (2007). (Ed), Qualitative psychology: A practical guide to research methods. London: Sage. Young, J.E. (1982). Loneliness, depression and cognitive therapy: Theory and application. In L.A. Peplau & D. Perlman (Eds. ), Loneliness: A sourcebook of current theory, research and therapy (p.379-406). New York: Wiley. Boyll, J.R. (1986). The effects of active exercise and passive muscle stimulation on self-concept, anxiety and depression. Unpublished doctoral dissertation, Northern Arizona University, Flagstaff. Li, X., Stanton, B., & Feigelman, S. (2000). Impact of perceived parental monitoring on adolescent risk behavior over 4 years. Journal of Adolescent Health, 27(1), 49-56. Weissman, A.N., & Beck, A.T. (1978). Development and validation of the dysfunctional attitude sclale preliminary investigation. Paper Presented at the Annual Meeting of the American Educational Research Association. p33, 27-31 March 1978. Toronto, Canada.